Taekwon-Do is a martial art developed in Korea by General Choi Hong Hi in the 1940s and 1950s. Taekwon-Do literally translates to 'the art of hand and foot'. Taekwon-Do took aspects of traditional martial arts such as Taekkyeon and Gwopbeop, Karate, and various Chinese martial arts to compile them into a complete fighting form. Taekwon-do is now renowned to many as the greatest martial art in terms of kicking power. 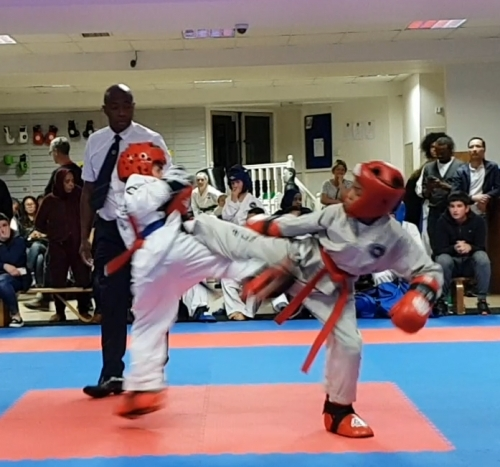 However, kicking is only one aspect of Taekwon-do, as it has an array of punches, strikes and defensive blocks that makes it an all round martial art for self defence. The ITF Kids Program is the official Taekwon-Do program taught to children aged 3 and 7 to provide them with a myriad of skills. The Kids Program was developed by our Chief Instructor Grand Master Donato Nardizzi who spent 5 years on the project. Grand Master Nardizzi is now the chairman of the ITF Kids Development Program, and this committee teaches the program through seminars all over the world. The students at Croydon Taekwon-Do Academy are fortunate enough to get first hand teaching from the creator of the program. Our program consists of a comprehensive study book which contains all the knowledge they need as well as the homework tasks. The topics in the book include life skills (such as teamwork, leadership, organisation skills etc.) mind skills (memory, concentration etc.) and character education (courtesy, integrity, perseverance) and fitness and health which are vital for their development. Children are given an assignment sheet in which they have to complete the various skills in class as well as some homework tasks. Once this is completed they are able to proceed through our grading system to which there are 6 levels: Ranging from white, yellow, green, blue, red, then black tag. If a child receives a beyond a black tag they will be eligible for our Juniors class beginning on a yellow belt in which they can further their learning. If your child is aged 7-12 you are eligible for our Taekwon-Do Juniors classes which offer a similar criteria to our Taekwon-Do Teens & Adults classes. The Junior classes are only 1 hour long compared to the 1 hour and 30 minutes in the Teens & Adults class to get your children use to the intense road ahead. In the lessons, students will practice patterns, sparring, board breaking and all techniques which are learnt in the Adults & Teen classes. ​If your child has gone through our kids program they can begin Taekwon-Do Juniors on a yellow belt. Students in the Junior class will be able to do the same grading as adults and teens, but for Juniors under 11 their grading will involve an easier theory sheet and no power breaking. It is possible for a Junior to achieve the rank of black belt, but once they are of this rank they will usually get moved up to the Adult & Teen class. Our Taekwon-Do Teens & Adults classes are 30 minutes longer than the Junior class, involving more fitness and technique training. We cater to those of all skill levels, dividing the classes up based on experience and belt to give each student the correct amount of attention required. ​In our Teens & Adults Classes we do fitness training, techniques, patterns,, self-defence drills, sparring drills, free sparring (yellow belts+) and even breaking (yellow belts+). We encourage students to train often so they are eligible to grade more frequently and enjoy the greater aspects of Taekwon-Do. Terms: You can only redeem this once per person.